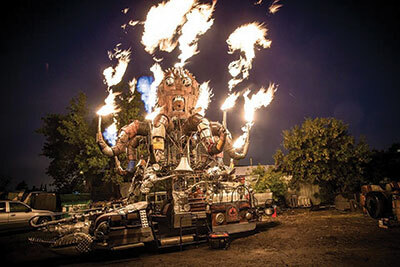 The highly anticipated finale of this year’s Beakerhead took place on Sept. 13. A free event, Beakernight attracted many Calgarians who gathered downtown to take in the event. The downtown Calgary streets became an outdoor park — or more accurately described as a laboratory — were filled with people taking in the experience and embracing the new art-friendly Calgary. El Pulpo Mecanico, a 24 flame-spewing octopus, that was originally built for Burning Man, wrapped up Beakerhead’s festivities. The goal of the event was to bring as many people as possible together to experience Beakerhead’s events in one easy place. Showcasing music, technology and fashion, with an opportunity to dress-up. Beakernight, which could be seen from blocks away and had everything needed for a cheap night out. Some of the main take-aways from the night included the fire breathing octopus, the techburlesque fashion show presented by Make Fashion, a dancing caterpillar and the final appearance of the renowned laser cat, an attraction that was threatened by the freak snowstorm. The fire breathing octopus named El Pulpo Mechanico was a highly anticipated feast-for-the-eyes to all in attendance. The night also featured a Big Rock lab for beer drinkers and an Absolut vodka Beakernight for those who choose to steer clear of the brews. The event, which received Canada-wide coverage. It was the perfect night to wind down summer, giving people the opportunity to enjoy a crossroads of creativity and technology. For more information on the future of Beakerhead, please visit beakerhead.org.